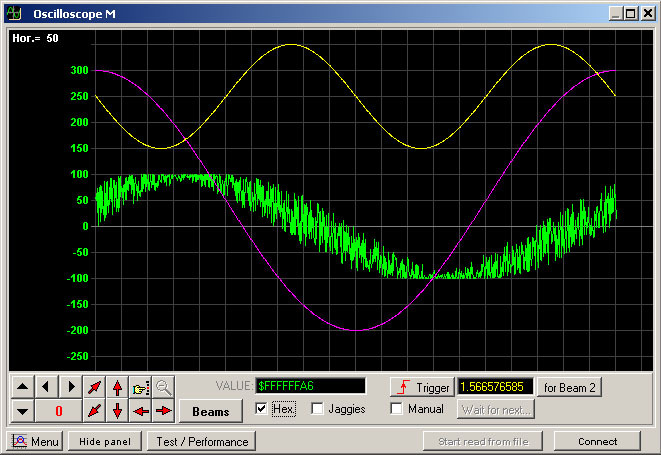 Universal Software Oscilloscope Library Real-time universal oscilloscope GUI ( Real-time plot ) DLL library. 1.Speedy performance: the library makes it possible to bring out into the beams of the viewing oscilloscope over a million quantization steps of signal per second (on the Pentium III machine) -- thus less than one micro-second is enough for one discreet. This software can be used for linking to real-time controlling programs as longer delays in relay of data to the oscilloscope don't occur. The relayed data is instantly displayed in beams, the process of their relay and display is deterministic. It works regardless of the signal relay speed. 5. Reliable and robust: this library employs only the most basic Windows API functions and reliably works in all versions of 32-bit Windows starting from the first 95 version. We tested and practically confirmed the possibility of relay of data to this oscilloscope directly from the computer's hardware interrupt procedure (IRQ) and from any kind of anisochronous thread - which is important. System requirements: IBM PC Pentium 1 (one), 32 Mb of RAM. See above information and user's reviews about Universal Software Oscilloscope Library Real-time universal oscilloscope GUI ( Real-time plot ) DLL library.